This compact wheel is light weight (5kg/11lb) and portable with folding treadle, built-in lazy kate and carry handle. Fold and go – it can be carried easily in cars, as carry-on luggage in planes (check with your airline first as this varies from aircraft to aircraft) and takes up little space at home. Spin a variety of yarns using the four ratios. The stretchy drive cord does not require any adjustment as you change from one ratio to another and always maintains the correct tension. The wheel and flyer are mounted on ball bearings for effortless spinning. Smooth and quiet with treadles mounted on polyurethane hinges to allow a comfortable heel-toe action. The wheel comes assembled and lacquered, ready for spinning. 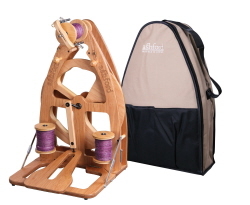 Included accessories: sliding hook flyer, 3 large (90mm) bobbins, built-in lazy kate and carry bag.